This project was created by the Software Engineering Maintenance and Evolution Research Unit (SEMERU) at the College of William & Mary, in collaboration with Universidad de los Andes, The University of Sannio, and The University of Lugano. The major goal of the MDroid+ project is to help mobile application developers and testers improve the quality of their test suites. This project empirically derived a set of 38 Android-sepcific mutation operators which can be automatically seeded into a target application and analyzed on a set of test cases. Click on the Logo to start the video. In order to define our mutant taxonomy we tagged 2,023 documents and the entities of the database can be accessed here. The black rectangle in the bottom-right part of Figure 1 reports the number of documents tagged as false positive or as un- clear. e other rectangles—marked with the Android and/or with the Java logo—represent the 14 high-level categories that we identified. Categories marked with the Android logo (e.g., Activities and Intents) group together Android-specific bugs while those marked with the Java logo (e.g., Collections and Strings) group bugs that could affect any Java application. Both symbols together indicate categories featuring both Android-specific and Java-related bugs (see e.g., I/O). Here we provide the list of all mutations operators were defined for MDroid+. Replace a BluetoothAdapter.isEnabled() call with "true"
Select a serializable class, remove "implements Serializable"
In MDroid+ we developed two wrappers that generate the mutants used in our evaluation and here you can have access to our tool and the wrappers we implemented. Overview: In order the extract a Potential Fault Profile (PFP), MDroid+ statically analyzes the targeted mobile app, looking for locations where the operators from Table 1 can be implemented. The locations are detected by parsing XML files or by AST-based analysis for detecting the location of API calls. Given an PFP for an analyzed app, and the catalog of Android-speci c mutation operators, MDroid+ generates a mutant for each location in the PFP. Mutants are initially generated as clones (at source code-level) of the original app, and then the clones are automatically compiled/built into individual Android Packages (APKs). Note that each location in the PFP is related to a mutation operator. Therefore, given a location entry in the PFP, MDroid+ automatically detects the corresponding mutation operator and applies the mutation in the source code. Overview:In order to apply the Major mutation testing tool to Android applications, we developed a wrapper that receives the root project directoryand srcdirectory of a an Android app as input arguments. Our wrapper then compiles a list of all java files in the main package of the application and applies the Major tool to each of these files, appending information regarding the mutations to a master log file for later traceability. Major will create a number of mutants for each Java file (creating one new Java file for each injected mutant) and once this process is complete, our wrapper then makes a copy of the original Android application project, replacing a java file with one of the generated mutant files. Thus, at the end of the process, our tool creates a set of complete android app project folders, one for each mutant generated by Major, with each mutant comprising a single syntactic source code change to a single Java file. Our wrapper then compiles the applications according to the build system appropriate for the app (e.g., ant gradle). Download Wrapper for Major Now! Overview: Applying the to PIT mutation testing tool Android applications was more technically complex, due to the fact that Pit operates on Java bytecode. To accomplish this we modified a wrapperformerly created by Joel Van Den Berg which allows for writing the modified class mutant class files generated by Pit to disk. Our wrapper for Pit requires only the .apk file for an application, decompiling the executable file into its constituent .class files using the dex2jar tool, we then apply the PIT tool to each class file along the main package of the application, keeping a record of each mutation using a master log file. One the mutant class files have been created, the wrapper then assembles the mutant projects, with each mutant project (being a collection of class files), containing one mutant class file. Our wrapper then repackages the apps using a multi-threaded process to allow for more reasonable execution time. We use the dex2jar and apktool utilities to re-package the bytecode for each mutant app into an .apk file. Download Wrapper for Pit Now! Are the mutation operators (available for Java and Android apps) representative of real bugs in Android apps? 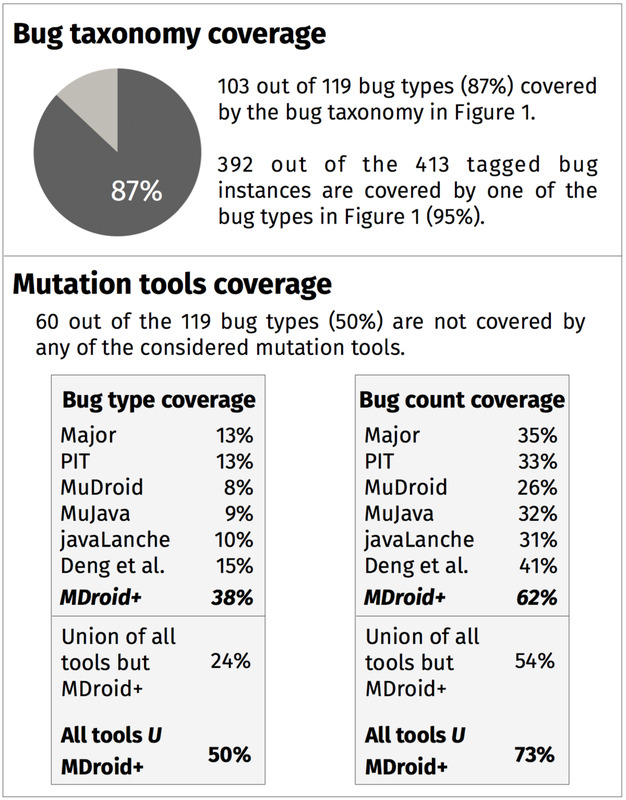 MDroid+ outperformed the other six mutation tools by achieving the highest coverage both in terms of bug types and bug instances. However, the results shows that Android- specific mutation operators should be combined with classic operators to generate mutants that are representative of real faults in mobile apps. What is the rate of stillborn mutants (e.g., those leading to failed compilations) and trivial mutants (e.g., those leading to crashes on app launch) produced by the studied tools when used with Android apps? First figure depicts the achieved results as percentage of Stillborn Mutants, the second figure presents the percentage of Trivial Mutants generated by each tool on each app. Third figure shows that on average, 167, 904, 2.6k+, and 1.5k+ mutants were generated by MDroid+, Major, PIT, and muDroid, respectively for each app. The larger number of mutants generated by PIT is due in part to the larger number of mutation operators available for the tool. MDroid+ generated the smallest rate of both stillborn and trivial mutants illustrating its immediate applicability to Android apps. Major and muDroid generate stillborn mutants, with the latter having a critical average rate of 58.7% stillborn mutants per app. What are the major causes for stillborn and trivial mutants produced by the mutation testing tools when applied to Android apps? All four tools generated a relatively low rate of trivial mutants, with muDroid again being the worst with an 11.8% average rate of trivial mutants. Our analysis shows that the PIT tool is most applicable to Android apps when evaluated in terms of the ratio between failed and generated mutants. However, MDroid+ is both practical and based on Android-specific operations implemented according to an empirically derived fault-taxonomy of Android apps. Please click the button below to obtain a copy of the data generated for each Mutation framework relating to RQ2 & RQ3 outlined above. Click Here to Download Study Data!